This chapter addresses how bottom-up urbanism relates to urban governance in Europe. 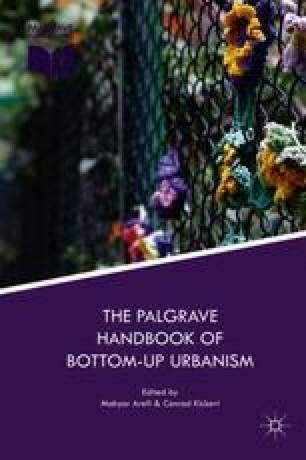 The recent proliferation of bottom-up urban initiatives contrasts with the conventional system of top-down planning. This chapter includes eight examples of bottom-up initiatives from Stockholm, Sweden, and Istanbul, Turkey. Three conclusions can be drawn: first, the discrepancy between organizational structures, a hierarchical governmental structure, and the dominance of politics create missing links in the relationship between municipalities and citizen-led urban initiatives; second, new governance arrangements alone are not enough to create opportunities for citizens to partake in participatory methods and to be involved in decision-making processes; third, the political perspective of social innovation reformulates mutual engagement by introducing political liaisons, such as municipal guides or neighborhood councils. Andersson, O. (2017). Segregationen är inbyggd och avsiktlig. DN [Online]. Available at: http://www.dn.se/kultur-noje/ola-andersson-segregationen-ar-inbyggd-och-avsiktlig/?forceScript=1&variantType=large. Accessed June 27, 2017. Brenner, N. (2015, April 1). Is “tactical urbanism” an alternative to neoliberal urbanism? MoMa [Online]. Available at: http://post.at.moma.org/content_items/587-is-tactical-urbanism-an-alternative-to-neoliberal-urbanism. Accessed May 13, 2015. Halbur, T. (2010, April 26). Andres Duany wants to reform the public process. Planetizen [Online]. Available at: https://www.planetizen.com/node/43935. Accessed February 28, 2017. Rucker, D. (2011, December 2). Why Duany is wrong about the importance of public participation. New Geography [Online]. Available at: http://www.newgeography.com/content/002046-why-duany-wrong-about-importance-public-participation. Accessed February 28, 2017. SCB. (2016, December). Key figures for Sweden [Online]. Available at: http://www.scb.se/en/finding-statistics/statistics-by-subject-area/population/population-composition/population-statistics/#_Keyfigures. Accessed February 28, 2017. Talen, E. (2014, September, 2). Do-it-yourself urbanism: A history. Journal of Planning History, 1–14 [Online]. Available at: http://jph.sagepub.com/content/early/2014/09/01/1538513214549325.abstract#corresp-1. Accessed March 24, 2015. UN-Habitat. (2013). State of the world’s cities 2012/2013 [Internet]. New York: Routledge. Available at: https://sustainabledevelopment.un.org/content/documents/745habitat.pdf. Accessed December 2, 2015. United Nations. (2016). The world cities in 2016—Data booklet [Internet]. Available at: http://www.un.org/en/development/desa/population/publications/pdf/urbanization/the_worlds_cities_in_2016_data_booklet.pdf. Accessed April 14, 2017.